First Bombstrikes release of the New Year and they kick things off in some style. After the huge farewell to the much-loved Volume series they show no sign of stopping in the delivery of consistently high quality dancefloor bombs. The label returns for the 3nd volume in their DJ friendly ?Into Battle series? with an EP of absolute monsters once again from 4 different artists. 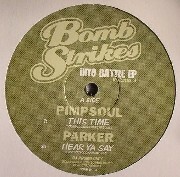 The EP includes tracks from Bombstrikes regular Pimpsoul, alongside label debuts for Parker & Slynk, who need no introduction. Rounding off the EP is a name to watch out for in 2011, Neon Steve. First up on the A side Pimpsoul delivers the speaker-worrying monster ?This Time?. With the trademark beats and electronic elements combined to great effect with a vocal hook, it is a surefire crowd pleaser. Next up scene favourite Parker delivers his own take on a rock classic in the amazing ?Hear Ya Say?. Combining all the production style he is so loved for with his dub influence it is massive debut on the label. Over on the flip it?s the turn of Aussie wonderkid Slynk to deliver the good and boy does he! Alongside Tom Drummond he drops the huge ?Woah Now? with funk, bass and one hell of a groove, its simply devastating. To finish things off Canadian Neon Steve shows exactly why he is worthy of all the hype with ?I Got Tha?. Guitar riffs and analogue feel basses roll over the tightest of grooves. Stunning! Another ridiculously strong EP from Bombstrikes. Delivering forward thinking dancefloor energy. Parker - "Hear Ya Say"
Neon Steve - "I Got Tha"